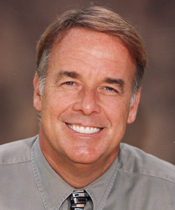 Porcelain Veneers in Santa Barbara - Dr, Mark T. Weiser — Dentist in Santa Barbara, CA | Dr. Mark T. Weiser D.D.S. The Secret to Dazzling Hollywood Smiles. Ever wonder how Hollywood stars smiles are that perfect? Simple: High quality porcelain veneers. And it's something that more and more people with funds are looking to do. Look around at the next party, business seminar or event — the secret is out! If you want a smile makeover, porcelain veneers could be the quickest way to a perfect-looking Hollywood smile. Veneers are razor thin slices of porcelain permanently bonded to the front and sides of your teeth. They look perfect in every way (shape and color). When expertly crafted, Veneers elegantly solve a number of smile problems, covering gaps and spaces, improving symmetry, covering stains, and of course providing a dazzling white smile. Why Choose Dr. Mark T. Weiser, Cosmetic Dentist for Porcelain Veneers? Porcelain veneers are a very popular aspect of our cosmetic dentistry practice. If you want a smile makeover, porcelain veneers could be the quickest way to a perfect-looking Hollywood smile. At our Santa Barbara, CA cosmetic dentistry practice, we specialize in porcelain veneers and more. To find out whether or not you are a candidate for porcelain veneers, make an appointment at the office of general and cosmetic dentist, Dr. Mark T. Weiser. Dr. Weiser has international acclaim as a Cosmetic Dentist - and here locally in Santa Barbara, CA. With extensive training, under the finest cosmetic dentists in the USA and Internationally, Dr. Weiser has appeared in the popular ABC show “Extreme Makeover” and the popular BBC show “A Brand New You” showing many of his smile makeovers. Dr. Weiser designs each smile according to the individual and has an excellent track record of success and satisfaction with porcelain veneers. We also offer financing for porcelain veneers. Call our Santa Barbara, CA dental office today for a consultation at (805) 899-3600. "Studies actually show that a smile may be the most memorable thing about a person. In a recent survey, 88% of those interviewed said they always remember someone with an especially attractive smile, 85% agree that an unattractive smile makes a person less appealing, and 74% agree that an unattractive smile can hurt a person’s chances for career success. A bright, free smile is a treasure, and with cosmetic dentistry, people who thought they never could, are smiling."